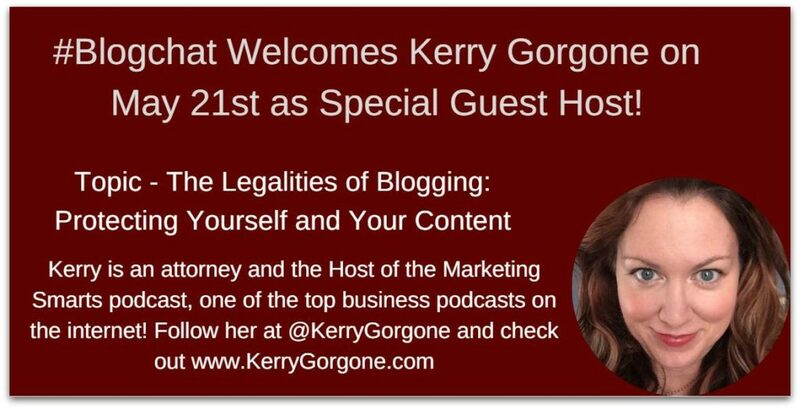 Kerry Gorgone Joins #Blogchat to Answer Your Legal Questions About Blogging! UPDATE: Here’s the transcript from an AMAZING and insightful #Blogchat on the legal issues of blogging with Kerry Gorgone! I’m very excited to welcome my great friend Kerry O’Shea Gorgone back to #Blogchat this Sunday (5-21-17) to answer your legal blogging questions! Kerry is an attorney and also one of the most decorated business podcasters on the planet! Her Marketing Smarts podcast is acknowledged by all as one of the best podcasts on the internet. The topic we’ll discuss is The Legalities of Blogging: Protecting Yourself and Your Content, starting at 8pm Central on Sunday, May 21st! 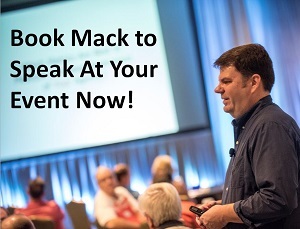 8:00-8:30 PM – We’ll cover Protecting Your Content. This will include how to copyright your content, what to do if someone steals your content, etc. Kerry has already written a great post on this here. 8:30-9:00 PM – We’ll cover Protecting Yourself. This will include discussing proper disclosure of sponsors and ads around your content, etc. Kerry has also written a great post about this on her site. And remember, #Blogchat is sponsored this month and next by Marketing Writing Bootcamp from Marketing Profs. Click here to learn more about the 13-class course AND get a special $200 discount just for #Blogchat participants! Hope to see everyone at #Blogchat Sunday night at 8pm Central! Make sure you are following Kerry on Twitter and bring your legal questions about blogging!